Printing your drawing can be done through the File → Print... (Ctrl+P) dialog. As of v0.46, the standard GTK print dialog is used. 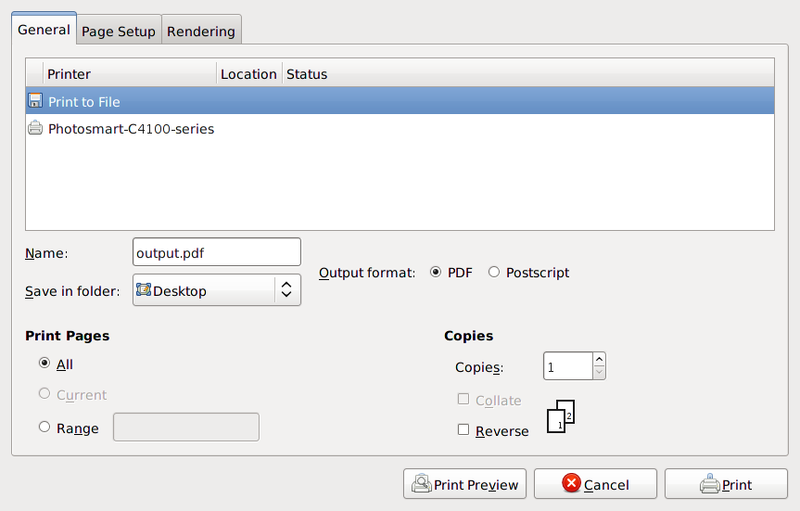 This allows printing to any PostScript-capable printer as well as to either a PostScript or PDF file. Printing uses the Cairo-based routines. The PostScript back-end makes heavy use of rasterizing the image. There are two options for rendering output found under the Rendering tab. The first Vector uses vector operators. the drawing is scalable. Prior to v0.47 patterns, masks, clips, and dashed lines are rendered incorrectly (Bug). The second option is Bitmap, which rasterizes the output. There is an option to set the DPI for the output. This does not appear to have any effect in v0.46 (Bug). All drawing elements are rendered correctly. An Inkscape PostScript file can be normally be used as an Encapsulated PostScript file (EPS) as it already has a “BoundingBox” line. You may need to change the first line from %!PS-Adobe-3.0 to %!PS-Adobe-3.0 EPSF-3.0 and delete the “showpage”) at the end of the file.